Some bosses are generous and they give gifts for Christmas. You are one of the lucky folks if you received Christmas gift from your boss. 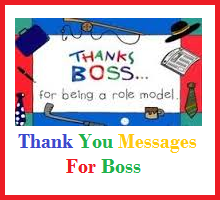 And indeed you must send a thank you message to show appreciation to your Boss for this kind gesture. 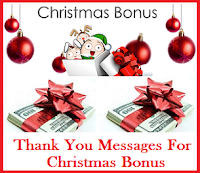 Here is a collction of sample thank you messages to boss at Christmas. 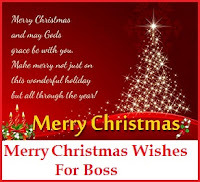 Also check our collection on Merry Christmas wishes for Boss. Thank you for the gift basket! My family will enjoy it over Christmas when we get together for some fun and dining. I would just like to express my sincere appreciation for the lovely present you gave to me for Christmas. It was a very generous of you to give it to me. It will definitely go to good use! My sincerest thanks go to you for such a nice Christmas gift, boss. I can see that you really enjoy making other happy by gifting exactly what they need. Thank you very much for sending me a very meaningful gift on this Christmas season. Your gift made this holiday even more special. Thank you for being an awesome boss and for being so generous with the Christmas gift. Thank you for the holiday sweets. I love the candy canes and the kids really enjoyed the chocolates; it was wonderful! Best wishes to you and your family! Have a Merry Christmas! Thank you for the notebook planner, boss. I am glad I didn’t have to line up at the store to get one of these collectible planners. You are the best. Happy holidays! Thank you for the unique paperweight you gave for Christmas. You are indeed, a smart boss coz I can use this and be delighted to see it each day. The fountain pen you gave me for Christmas was a delightful gift. Thank you, boss. You really know how we both value time, and you just gave a fitting Christmas gift to symbolize that. Thank you for the watch you gave me for Christmas! Thank you for the very beautiful and sumptuous gift basket you sent for Christmas for my family. This will give us and extra special holiday feast. Thanks, boss! Thank you, boss. The stationery you gave last Christmas totally fits my personality. I will definitely use this. I am so happy for the gift certificate you gave me for Christmas. I can now shop for gifts for my kids. Thank you, boss! Thanks for Christmas vacation package, boss. I really appreciate your generosity and sensitivity. I will surely use my vacation leave this year. Thank you, boss, for the flashlight you gave last Christmas. This gift means I have to go on more camping trips next year. Seriously, I really love it. Thank you for the exquisite wine you sent as a gift for Christmas. This year’s Christmas dinner will be very special for me and my family. Thanks again, boss! Thank you for the new desk you gave me for Christmas. It’s time to retire my old one and give it my son as study table. Thanks, boss. The book you gave me for Christmas was very inspiring and motivating. Thank you, boss! 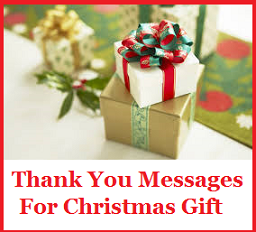 Thank you for the coffee beans you sent as a Christmas gift. I am indeed, so blessed to have you as a boss. Now, my room looks nice because of the motivational poster you gave last Christmas. Thank you, boss. Thank you for the Starbucks gift cards you sent my way for Christmas. These will give a great boost to my waking hours at work. I really appreciated the cool coffee mug you gave for Christmas. It’s a scene stealer during our break time. Thank you, boss.